Up to 70% Off Baby Boom! Up to 70% Off Entire Site! FREE Pickup Today is brand new and we couldn't wait to share it. FILTER BY SIZE is under construction and coming soon! Sign up for an Extra 20% off♢ your first Carter's or OshKosh purchase. Plus, be the first to see new arrivals, exclusive offers + more. ♢Valid in store and online. Excludes clearance, doorbusters, Skip Hop, non-Carter’s and non-OshKosh branded footwear. Other restrictions may apply. To see all terms and conditions visit carters.com/couponpolicy. © 2019 Carter’s, Inc. All rights reserved. 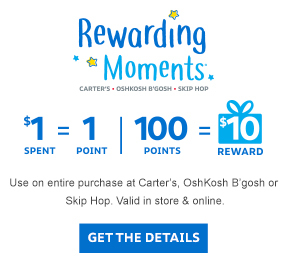 CARTER’S, COUNT ON CARTER’S, CARTER’S LITTLE BABY BASICS, EVERYTHING YOU NEVER KNEW YOU NEEDED, WITH YOU FROM THE START, CHILD OF MINE, JUST ONE YOU, SIMPLE JOYS, OSHKOSH, OSHKOSH B’GOSH, B’GOSH, BABY B’GOSH, ALWAYS BE GENUINE, SKIP*HOP, and MUST HAVES*MADE BETTER are trademarks owned by subsidiaries of Carter’s, Inc.